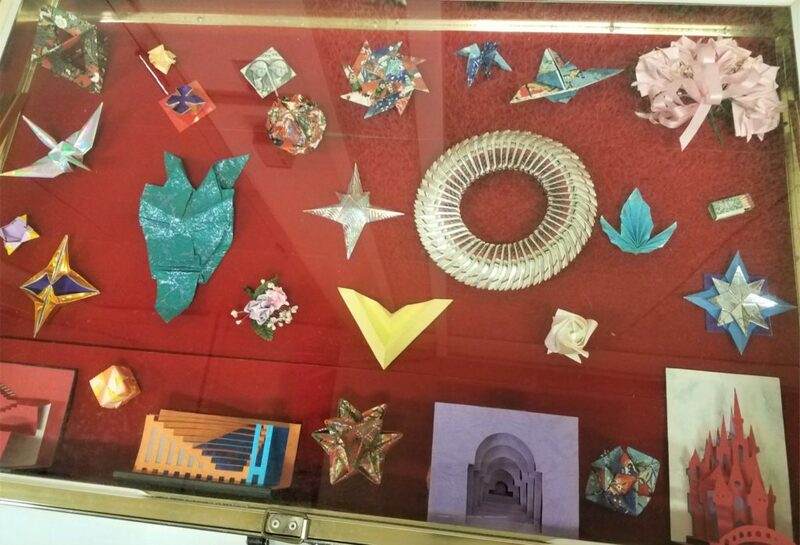 WSU recently hosted an origami workshop on campus! 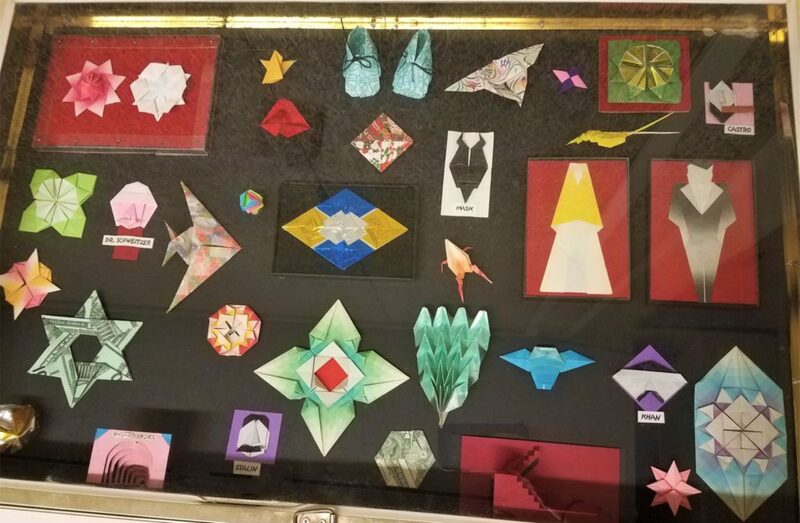 The origami workshop at Worcester State University allowed students to practice the traditional art of folding paper in celebration of Asian Heritage Month to promote awareness on campus about diversity and cultural practices. The Worcester State University Third World Alliance, a program run by the Office of Multicultural Affairs, hosted the origami workshop on April 10, 2019, which took place at the North/South Auditorium in the WSU Student Center at 5:30 p.m.
At the origami workshop, there were three tables set up and stacks of colorful square pieces of paper for the origami. Display cases filled with origami of all different shapes, colors, and designs were set out tables while Asian food and drinks were also available. The room was filled with laughter and discussion while students prepared to create paper-folded artwork. 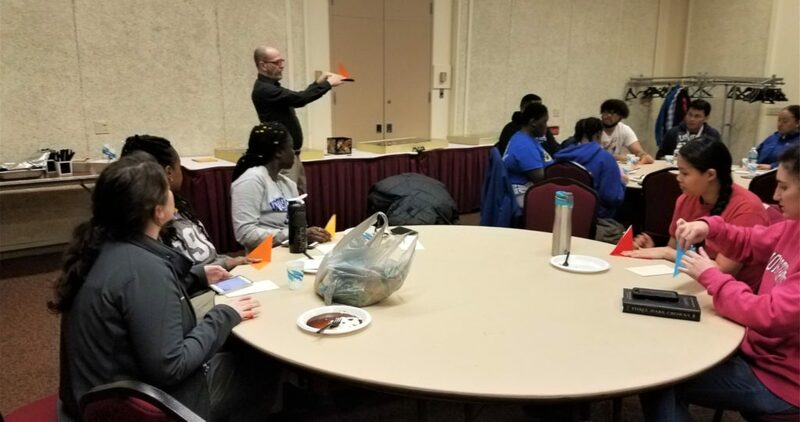 During the class, Ken Sprano, an origami artist and instructor, taught students how to fold the paper and create different designs. All of the students were actively engaged throughout the workshop as they tried to imitate Sprano’s work with their own pieces of paper. Origami is the Japanese art of folding paper into decorative figures or shapes. Traditionally, this practice of paper folding does not involve glue or cutting the paper with scissors. A Public Broadcasting Service article about the history of origami explains the past significance of this practice. Origami was used for ceremonial purposes in as early as six B.C. by Buddhist monks. In 105 A.D., paper was invented in China and then brought to Japan by monks in the 1500s. During this time in ancient Japan, paper folding was often used for religious purposes, usually Shinto ceremonies, or for architecture development. While some scholars argue that origami is a Japanese invention instead of a Chinese invention due to a lack of Chinese paper folding records, most historians agree that Japan is the country that fully developed the traditional art of origami. In the Edo period, spanning from 1603 to 1868, paper folding with multiple folds and cuts became recreational and ceremonial in Japan. It was viewed as an affordable and mass-produced art form that many participated in. Origami was traditionally passed on by oral tradition until 1797, when the first written instructions for paper folding was written by Hiden Senbazuru Orikata, and Adachi Kazuyuki published a compilation of paper folding with Kayaragusa. The term for paper folding was originally orikata, which translates to “folded shapes,” because the Japanese word “oru” means to fold and the word “kami” means paper. Eventually, the term for the art form was changed to origami. Paper folding is a type of heritage that was also present in Europe when the Moors brought a tradition of mathematically-based folding to Spain in the 12th century after the Arabic world learned of papermaking in the eighth century. The Spanish practiced papiroflexia, which is an artistic practice of paper folding that went beyond geometric designs that is still popular today in Spain and Argentina. Origami is still practiced across the world. In the 1950s, Master Akira Yoshizawa, who is widely regarded as the father of modern origami, published books about new models of origami and developed the standard set of origami diagram systems that are commonly used today. Yoshizawa’s work introduced people across the globe to origami. His pieces also led to the formation of origami associations like the Origami Center of America and the British Origami Society. Today, many schools incorporate origami clubs or workshops for interested students of all ages, as evidenced by the recent origami workshop at Worcester State. The magazine Psychology Today revealed that origami has many benefits, including the ability to help people to develop mindfulness. One benefit of this practice is that origami is easily accessible in any location at any time for many people because all that is needed is a piece of paper. Another positive aspect of origami is that it enhances the ability for a person to focus on what is happening in the moment. Studies revealed that children have used origami as a tool to develop perception and spatial skills, refine hand-eye coordination, improve concentration, and learn mathematics. Samuel Tsang, a London origami teacher and author, believes that origami is the perfect combination of crafts, art, science, and meditation. Many people have relied on the practice of origami to hone skills of persistence, practice, and patience, as well as to promote mindfulness and calmness, similar to yoga or meditation. “Some of the benefits of the origami workshop include learning about the rich history and culture, learning how the art of mathematics are manifested through these wonderful patterns, student bonding, and many more direct and indirect benefits,” said Bissoondial. Students at Worcester State University have various levels of familiarity with the practice of origami. 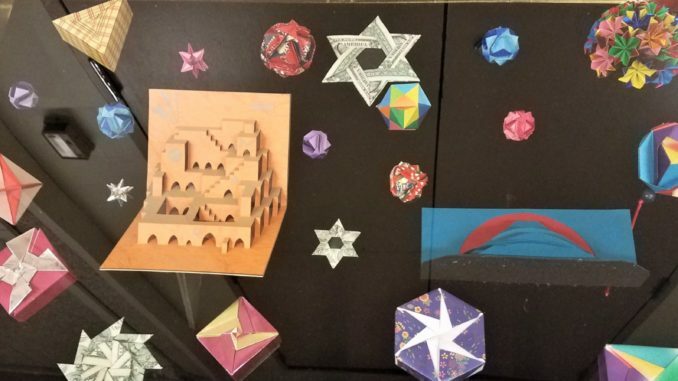 Despite this variation of experience, the origami workshop is being hosted to help promote the benefits and enjoyment that students can receive from origami. Similar to Dimaria, other Worcester State students were also initially introduced to origami as a child. 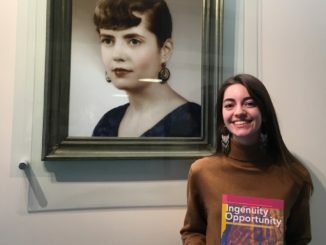 Osuagwu had a teacher when she was younger that taught her the history of origami, including where it originated from and how to successfully practice the paper folding. For some students at Worcester State, the origami workshop was their first encounter with this traditional artform. There have been many events in previous years to honor Asian Heritage Month on campus, though this is the first time that there has been an origami workshop hosted at Worcester State. Ojo had brought forth the idea for the workshop to Third World Alliance because she believed that it would be enjoyable for there to be an Asian Heritage Celebration social event where people can learn about the art of origami. 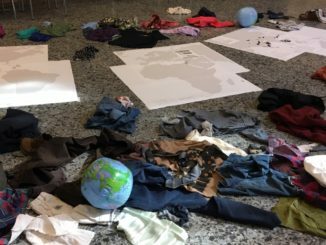 Going forward, members of the Third World Alliance at Worcester State University hope to continue supporting the different cultural practices and the diversity on campus by celebrating various months with many activities for students to participate in. Bissoondial encourages interested Worcester State students to join Third World Alliance and the Multicultural Student Organization in order to make a difference and leave their mark on the campus before graduating. In the Worcester State Student Center on April 17, 2019, there will be a film screening of “Don’t Think I’ve Forgotten: Cambodia’s Lost Rock and Roll,” which is a film about surviving Cambodian music and and what the music meant to the lives of pre-Khmer Rouge Cambodians who experienced it. 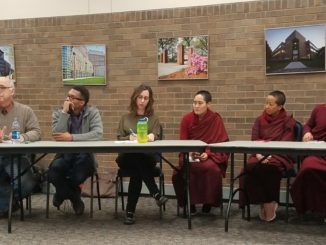 The filmmaker and assistant professor of sociology at the College of Mount Saint Vincent, Lin Da Saphan, will lead a discussion after the film.